Beach: Ocean is short bike or walk. Bay is even closer. This is a spacious, open, and bright upside down house complete with all modern amenities. 'Osprey', as we call it, is set well off the road with its own private driveway. 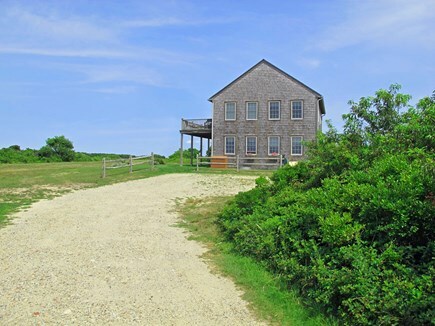 The upstairs living room opens through french doors onto a 30 foot wide deck with sweeping views of wetlands and Madaket Harbor which provides Nantucket's best sunsets. 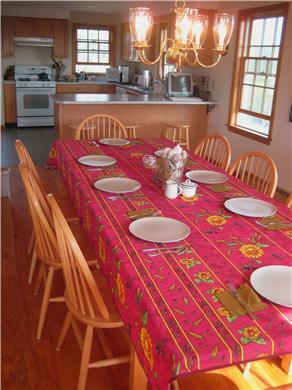 The house is minutes away from one of the best surf beaches and a short walk from the boatyard and quiet harbor beach. Surf casting, crabbing, and turtle pond are all right nearby. The NRTA bus service stops only a half block away from the driveway allowing easy access to town whether or not you bring a car. The Madaket Bike path, probably the best designed path on the island, is also only one half block away. No pets or smoking please. Air conditioning in living and bedrooms. Nearest beach: Ocean is short bike or walk. Bay is even closer. It's soo quiet! This house is perfectly located for people looking for peace and quiet ... The house itself is fantastic. Tons of room and it was sparkling clean when we arrived. The view out from the deck is beautiful and we spotted geese, bunnies and deer in our yard each day. Not to mention the sunsets, then stars at night ...wow! 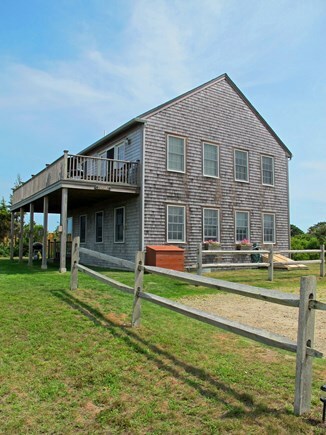 "This modern, spacious, newly built home was the perfect setting to relax on Nantucket. The owners have taken the time to make it truly special. The large deck, fully-equipped kitchen, dining room, beautiful artwork and comfortable living room make it perfect for entertaining. Perfect for a family getaway, right near the beach, harbor and a quick trip to town for grocery shopping and restaurants. Setting is quiet and private. Highly recommend renting this spectacular home." "Modern and spacious, the Ospreys has an incredible view from the deck, which is just perfect for sunset drinks. Quiet, but not isolated and the beach just minutes away. Both kids and parents were in heaven." "This is a great house. It was perfect for our family. 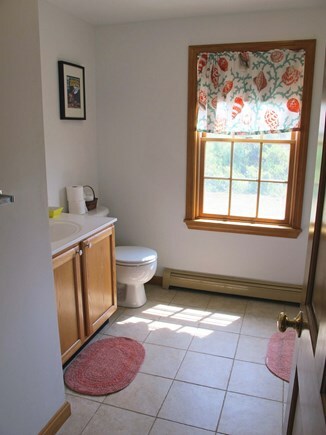 Very private, great views, comfortable and clean. Nice large deck perfect for having drinks while watching the sunset. Close to the beach." "New house with big deck (sunset!!!) right on the marsh next to conservation land. Very pretty, airy and spacy. Perfect condition. Equipped with everything you'll ever need. Beautiful view and not far to the beach." "We've stayed here twice and loved it. The house is spacious, bright (windows everywhere but very private), nicely decorated, and has everything you could possibly need. 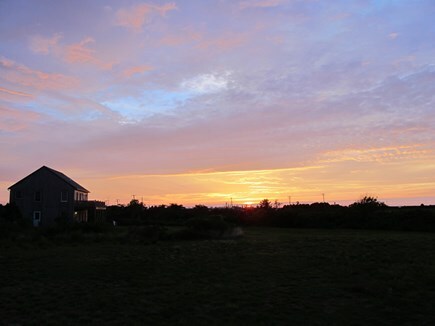 We especially loved using the deck off the living room in the early evening - the sunsets are spectacular! 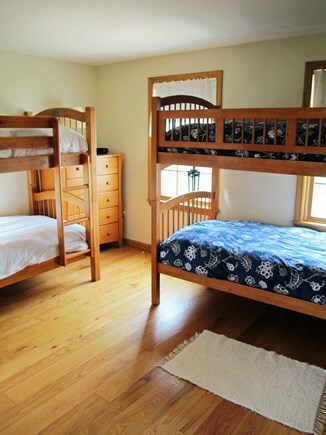 The beds are incredibly comfortable with good quality linens, pillows and down comforters. This is a great vacation house."